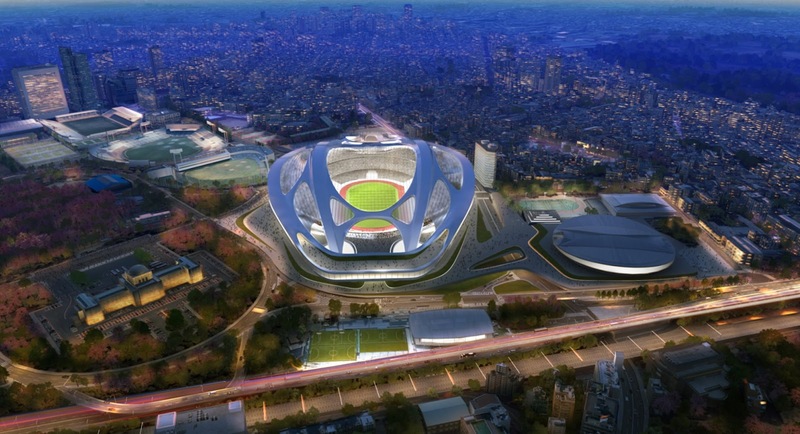 Tokyo's New National Stadium, it's a Bicycle Helmet! The existing National Stadium in Kasumigaoka, Shinjuku which was originally built for the 1964 Olympic Games is about to undergo a $1 billion redesign by British architecture firm, Zaha Hadid Architects, and will be reborn as a giant alien spacecraft or as we like to think of it, a huge bicycle helmet. The stadium will play host to the 2019 Rugby World Cup and if Tokyo is successful in its bid to host the 2020 Olympic Games it will also be the location for both the opening and closing ceremonies of the games along with the track and field events. The redesigned stadium features a retractable roof, exceptional pedestrian access via elevated walkways and will have a seating capacity of 80,000. Additional requirements for the design of the stadium included that it fit with the existing surroundings of the area, and adhere to strict "environmental efficiency" constraints. Judges commented that the design by Zaha Hadid compliments Tokyo's crowded cityscape with its sleek fluidity. Born in Iraq, Hadid has previously designed the Aquatics Centre in London, used for the 2012 Olympics, and became the first female architect to win the Pritzker Architecture Prize in 2004. Construction on the new national stadium is scheduled to begin in late 2015, shortly after the old stadium is torn down. We love the look of the new stadium but only wish the proposed Olympic Velodrome had such a fitting design. What do you think of the new stadium design? Update: Read what we know about cycling events and facilities for the 2020 Tokyo Olympics. It is not the first time that an arena in Japan is designed as bicycle helmet. 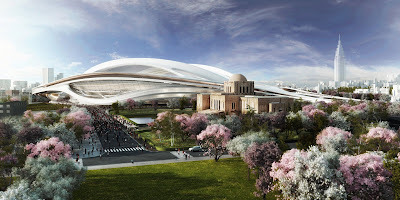 The Kitakyushu Media Dome is a velodrome that has a design inspired by the time trial helmets of the period.